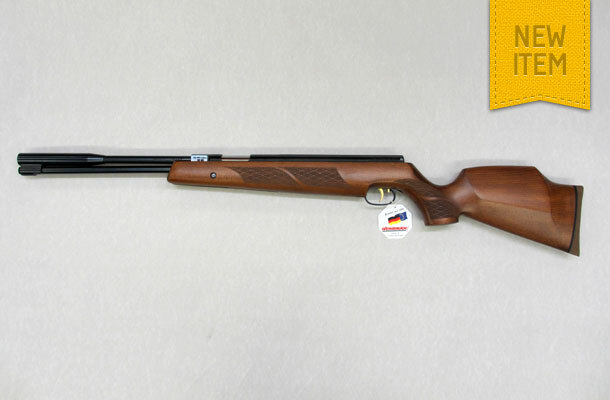 The Weihrauch HW97K is Weihrauch’s flagship spring powered air rifle. It features the “Rekord” two – stage trigger assembly with automatic crossbolt safety. Cocking is obtained via the underlever positioned underneath the barrel. The gun is available in either .177 or .22 caliber. Other characteristics include an anti-bear trap assembly, sound moderator and extended forend. The beechwood stock has an applied walnut finish and is fitted with a rubber recoil pad. Weight of gun only is 4.2kg.